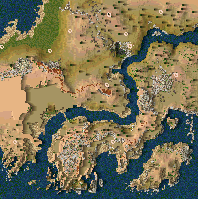 The Old Coast Road is a map lifted from my East Burh series of invasions. As I always intended to use this as a freebuild as well as part of a series of maps, I have invested a lot of time trying to create a freebuild that wasn't just a large, flat area of open land, but a natural, realistic looking landscape. It may appeal to some, who knows! Use the terrain to create a castle nestled in the cliffs overlooking a great river. Resources are plentiful enough, and there is sufficient land to allow crops to be grown. What a georgious map! The land design is well thought out and realistic, a joy to play! This i think is the most realistic map i have ever seen ... the landscape is awesome, terrain looks great and you can tell a lots of work and time was invested in this map. This map is both a very good freebuild and a nice piece of eyecandy and i think it desearves best to enter in "Best of SH". Really great work, and i`m waittin` for more maps like this one `cause it`s a real joy to play this kind of maps. Playability: Very good, kind of hard to get going and lots of fun. Balance: This is extra for the map design, as balance is pretty much non-existent in Freebuilds. Creativity: A coastal cliff map, very nice. There is still plenty of room to build unlike in the island map that came with the game. Map Design: Bravo! Wonderful! So realistic, it had to take forever to make it. Absolutely beautiful! Story: Nothing you can really say, as it is from another story, but there could be no text at all. Great fun! Belongs in an art museum! Download now! Well, do it! This was a really fun free build map to play. It also looked really nice. good job making it. Well..when I started this map; I was not going to do it, I was a major fan of open grass maps. This changed my opinion completely. I like this map, I give it a 4.9, woulda been 5 but it's the game's fault for the cliffs; those lil places where the wall looks weird. I agree with that other guy who said that "this should be in the best of stronghold"
When passing I noticed this lacked a mini-map so I have added one. While updating I had to make a guess at the version. I guessed v 1.1.